This is ADORABLE, Allisa!!! I love EVERYTHING CTMH and those owls are just too cute. I was a consultant for 4 years and attended a couple conventions. Fun stuff! FABULOUS job interpreting this week's Unscripted Sketch. These colors totally rock! I love how you carried the chevrons from the mat to the sentiment banner. The wee owls are just too cute - going to check out the Valentine Kit pronto! Great card Allisa! Love your take on the sketch. Love those owls, Allisa - thanks for linking up at Unscripted Sketches this week! Chevrons and owls, two of my favorite things. :-) Adorable card Allisa! Hugs! Whooo loves this?! Sorry, I couldn't resist! This is adorable, Allisa!! What cuties ... love that little pair of owls ... so glad you joined us at Unscripted Sketches. Too too cute. 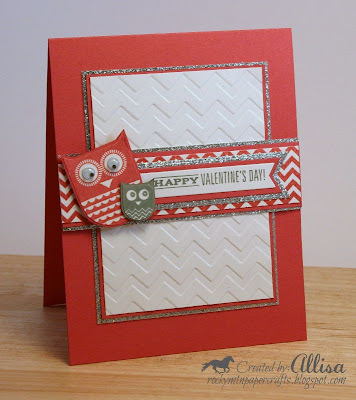 I love the owls and the colors and embossing is awesome. Great take on the sketch. 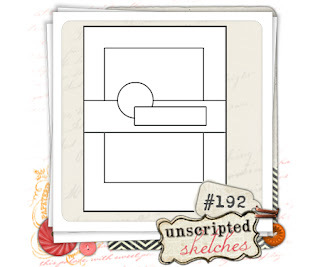 Thanks for joining us at Unscripted Sketches. So cute! I love owls and these are adorable! Thnaks for moinkng us at Oozak challenges.